We believe that part of our responsibility as a community band is to support our local patrons by providing music and entertainment for their events. Our members contribute their time and talent to help make a difference in Irving and surrounding cities. 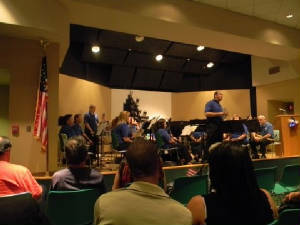 Heritage Senior Center's "Patriotic Bash"
Cimarron Recreation Center's "National Night Out"
Dallas Wind Symphony's "Starlight Music Festival"